In a previous post, I had written about an experience at @Wanderlustfest when I was able to talk to someone from @Toyota about the Prius hybrid. We spoke about the car, its track record and the benefits and drawbacks of electric charging. Well my shopping days had been on hiatus until recently. With end of year arriving, I knew I needed to kick it into high gear and get out and test drive the vehicle. Living in Minneapolis, weather can be tricky. I chose to go out immediately following a large storm. This was the only time that fit within my schedule given client needs and the holidays. Having done this though, the car was tested to see how it would handle on ice-chunked freeways and snow-covered side streets. Driving a new car can be challenging because you are unsure of where navigation tools are located and it is a completely new experience. I had the added pressure of learning on the fly amid winter conditions. The immediate impression was that it lived up to its brand reputation. It was comfortable, solid and handled well. The sales experience also delivered. Wayne – my salesperson – was fantastic. He has been selling @Toyota cars for 37 years. He knows the car well and gave me a quick tutorial for my test drive. He was no-pressure and answered all questions. At delivery, he did a fantastic job explaining key details. Overall, a terrific brand experience. 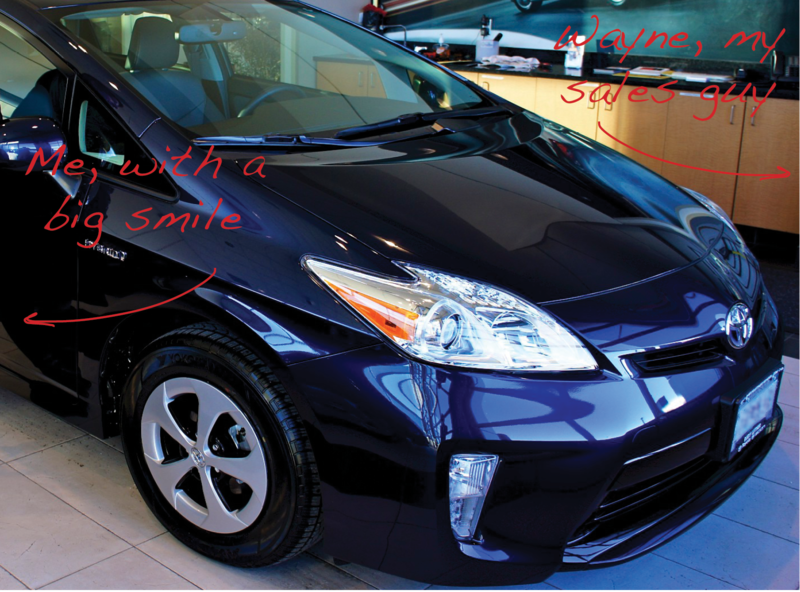 Needless to say, I am now the proud owner of a 2013 Prius, my first new car in 12 years. My limited edition Vapor Blue VW Beetle is being passed along and I hope it will make them as happy as it has made me. Here’s to 2013 and my new ride!